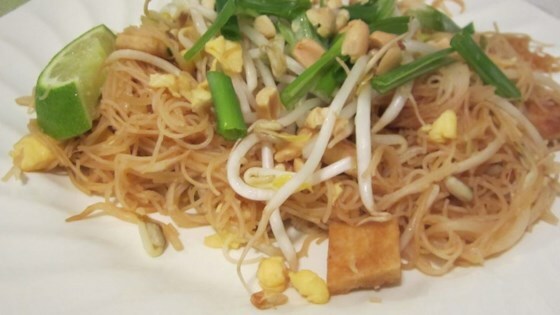 "This is an authentic Thai recipe, with the proper ingredients (no ketchup or peanut butter). It is easy, quick, and absolutely delicious." Soak rice vermicelli noodles in a bowl filled with hot water until softened, 30 minutes to 1 hour. Drain and set aside. Heat peanut oil over medium heat in a large wok. Cook and stir tofu in the wok, turning the pieces until they are golden on all sides. Remove tofu with a slotted spoon and drain on plate lined with paper towels. Pour all but 1 tablespoon of used oil from the wok into a small bowl; it will be used again in a later step. Heat the remaining 1 tablespoon of oil in the wok over medium heat until it starts to sizzle. Pour in beaten egg and lightly toss in the hot oil to scramble the egg. Remove egg from the wok and set aside. Pour reserved peanut oil in the small bowl back into the wok. Toss garlic and drained noodles in wok until they are coated with oil. Stir in vegetable broth, lime juice, soy sauce, and sugar. Toss and gently push noodles around the pan to coat with sauce. Gently mix in tofu, scrambled egg, salt, chili flakes, and 3 tablespoons peanuts; toss to mix all ingredients. Mix in bean sprouts and green onions, reserving about 1 tablespoon of each for garnish. Cook and stir until bean sprouts have softened slightly, 1 to 2 minutes. Arrange noodles on a warm serving platter and garnish with 3 tablespoons peanuts and reserved bean sprouts and green onions. Place lime wedges around the edges of the platter. it wasn't really quick to make, but it was delicious as written. didn't change a thing. Absolutely incredible! Only change, I omitted the bean sprouts. I will definately will make over & over again! Amazing!!! Made this 2 times this week. Fresh and light. Second time I made 2 batches one with tofu and one with chicken. Both were great!!! Not too bad although I would recommend adding some fish sauce instead of salt.